Al Hartmann | Tribune file p hoto Shaun Cowley sits in a pre-hearing conference before the West Valley City Civil Service Commission Tuesday February 18, 2014. He is fighting to get back on the West Valley City Police force. 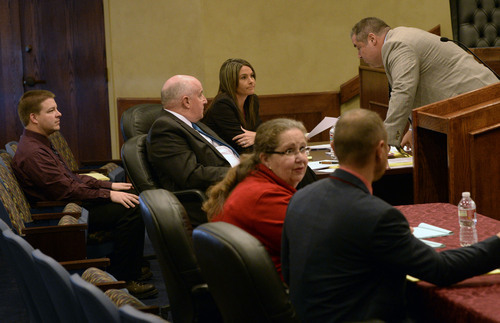 Al Hartmann | The Salt Lake Tribune Defense lawyer Lindsay Jarvis, left, represents Shaun Cowley in a pre-hearing conference before the West Valley City Civil Service Commission Tuesday February 18, 2014. 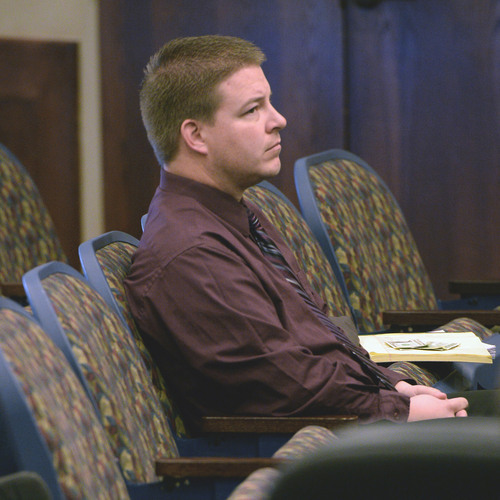 Shaun Cowley is fighting to get back on the West Valley City Police force. Al Hartmann | The Salt Lake Tribune Shaun Cowley, left, sits in a pre-hearing conference before the West Valley City Civil Service Commission Tuesday February 18, 2014. His defense lawyers Keith Stoney and Lindsay Jarvis represent him. Cowley is fighting to get back on the West Valley City Police force. Al Hartmann | The Salt Lake Tribune Shaun Cowley left, sits in a pre-hearing conference before the West Valley City Civil Service Commission Tuesday February 18, 2014. His defense lawyer Keith Stoney addresses the commission. Cowley is fighting to get back on the West Valley City Police force. 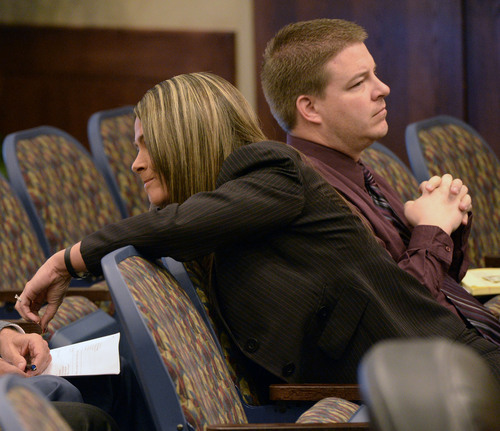 Al Hartmann | The Salt Lake Tribune Shaun Cowley, left, talks to his defense lawyer Lindsay Jarivis in a pre-hearing conference before the West Valley City Civil Service Commission Tuesday February 18, 2014. Cowley is fighting to get back on the West Valley City Police force. 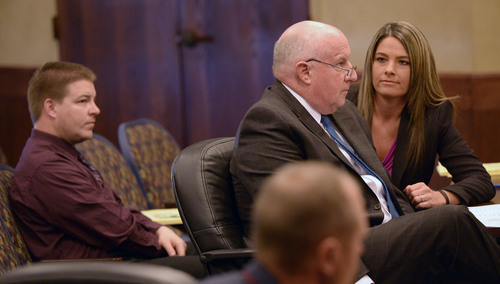 Al Hartmann | The Salt Lake Tribune West Valley City police chief Lee Russo, right, talks to Shaun Cowley's defense lawyers Lindsay Jarvis and Keith Stoney in a pre-hearing conference before the West Valley City Civil Service Commission Tuesday February 18, 2014. Cowley is fighting to get back on the West Valley City Police force. West Valley City • Both sides Tuesday were gearing up for a weeklong hearing which will determine the future of a fired member of the police department&apos;s notorious narcotics unit. 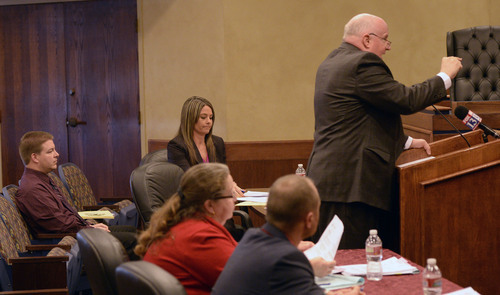 In the final pre-hearing, attorneys for both sides hashed out last-minute details before the city&apos;s Civil Service Commission for the hearing of former West Valley City police Detective Shaun Cowley, a former member of the discredited and now-defunct Neighborhood Narcotics Unit, who is fighting for his termination to be overturned. The appeal hearing, which is expected to last five days, starts Monday. Cowley was fired for allegedly mishandling evidence, but his attorneys argued Tuesday that the city has not complied with the rules or provided documents backing up their claims, making it difficult to defend Cowley against the allegations that led to his termination. Those allegations have not yet been made public. "We can&apos;t defend ... Cowley until the city gives him notice of all the offenses," Cowley&apos;s attorney, Keith Stoney, argued. At one point during Tuesday&apos;s hearing, Stoney  while indicating that the city was refusing to provide them with Cowley&apos;s drug-test results  appeared to voice concerns that there could be allegations raised that Cowley had been using stolen drugs. Attorneys later clarified that Stoney wanted the drug tests as a pro-active measure in case the city raises that issue. An earlier version of this story misreported that the city had accused Cowley of using stolen drugs. 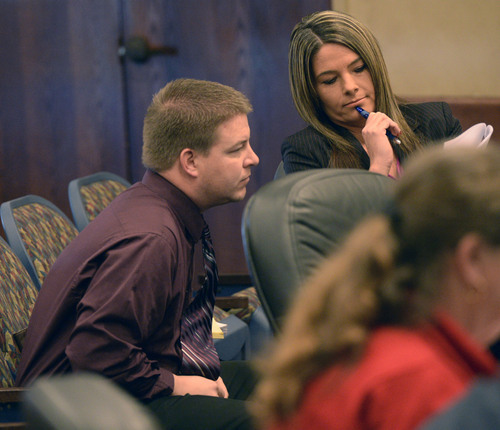 Cowley&apos;s attorneys insist he has not used any illegal substances. Cowley&apos;s attorneys also argued that it was going to be difficult to defend him because members of his disbanded unit were expected invoke their Fifth Amendment right against self-incrimination. Cowley attorney, Lindsay Jarvis, said that if any of those officers still have pending criminal charges against them, they should all be on leave. She also alleged that Cowley was the victim of unequal discipline, was made into the department&apos;s "scapegoat" and that officers who committed similar offenses were never disciplined. Cowley fired the shot that killed 21-year-old Danielle Willard during an alleged November 2012 drug bust. That shooting is reportedly not listed as reason for his termination. The Salt Lake County District Attorney&apos;s Office deemed the shooting of Willard was not legally justified. No criminal charges have been filed against Cowley in connection with the shooting. The shooting episode sparked an internal probe of the narcotics unit after drug evidence dating back a year was allegedly found in the trunk of Cowley&apos;s patrol car, not the department&apos;s evidence room. The probe revealed multiple violations, including that members of the unit had mishandled evidence, inappropriately used GPS tracking devices, kept trophies, or removed change and other property from suspect&apos;s vehicles. Six of the officers have been disciplined; a seventh officer remains on paid leave in connection with the Willard shooting. Cowley and former Lt. John Coyle are both appealing their discipline. Meanwhile, the three-member civil service commission continues to mull whether to reinstate officer Coyle to his former rank of lieutenant. During a hearing last month, Coyle  who headed the narcotics unit  claimed his discipline was overly harsh compared to other officers in the unit. Coyle&apos;s demotion resulted in an annual pay cut of about $20,000, said his attorney, Erik Strindberg, while people beneath Coyle were given "slaps on the wrist." But during Coyle&apos;s two-day appeal hearing, city attorneys called him a poor leader, who knowingly let his unit run amok, failed to take responsibility for his actions and had a disregard for the law and police procedures.